(Felis rufus) The cat is named for its tail which appears to be bobbed. They hunt in stealth fashion and will deliver a deathblow with a leaping pounce that can cover 10 feet. 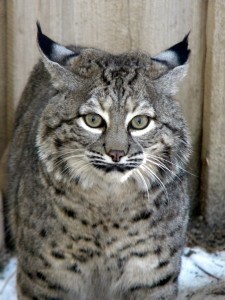 The bobcats in our care have lots of personality and are full of fun antics. What does the Bobcat eat? Bobcats are carnivores. They eat rabbits, mice, squirrels, chipmunks, birds and other small game. In the winter when other prey is scarce, the males will even hunt deer, or if near human habitations, sheep, poultry and young pigs. Bobcats will cache large kills. 14 to 16 years in captivity, but some have been known to live up to 20 years! How many bobcats can be born at a time? One to six kittens are born at a time. They are weaned at 12 weeks of age. They will remain with their mother until they are 12 months old. Bobcats are found in much of North America and also through Mexico. They are found in forests, swamps, deserts and even in suburban areas. It is estimated that there over a million bobcats in the United States alone. Bobcats are elusive and nocturnal. The cat is named for its tail which appears to be bobbed. Bobcats hunt in stealth fashion and will deliver a deathblow with a leaping pounce that can cover 10 feet. Bobcats mark their territory or home range with urine, feces, scent markings, scratches on trees and scrapes (piles of dirt and debris marked with scent). The bobcat’s growls and snarls are so deep and fearsome, they sound as if they are coming from a much bigger animal. Bobcats can have home ranges as big as 20 square miles. Bobcats are so ferocious that even Mountain Lions will try to avoid them. That doesn’t mean the Mountain Lion wouldn’t win in a fight, but the bobcats are such aggressive fighters, it is usually not worth it for the Mountain Lion to get involved. Sassy – a female who came to live with us in 2007. She had been hit by a car up here in Big Bear and had a broken pelvis that didn’t heal properly. Sassy lives up to her name and has lots of attitude! Mica – a female, was born in 1999. She came to us in 2004 from the California Living Museum in Bakersfield. She was a confiscated “pet” that had been completely declawed. As she is unable to defend herself, she will be with us for life. Shakespeare – in 2012, a baby male bobcat whose eyes were still closed was found in a backyard in Redlands. It is assumed that the mother was transferring her babies from one place to another, but ran away when the homeowner’s dogs were let out into their backyard. The home owners took the tiny bobcat to the Redlands Animal Shelter and the Animal Shelter called us. Because Shakespeare’s eyes were still closed, he ended up imprinting on people. He is quite a show off at the zoo. He loves to stalk people and then pounce at the front of his cage when he thinks no one sees him. Baby – was rescued as a baby when she was found in a fire clearing.